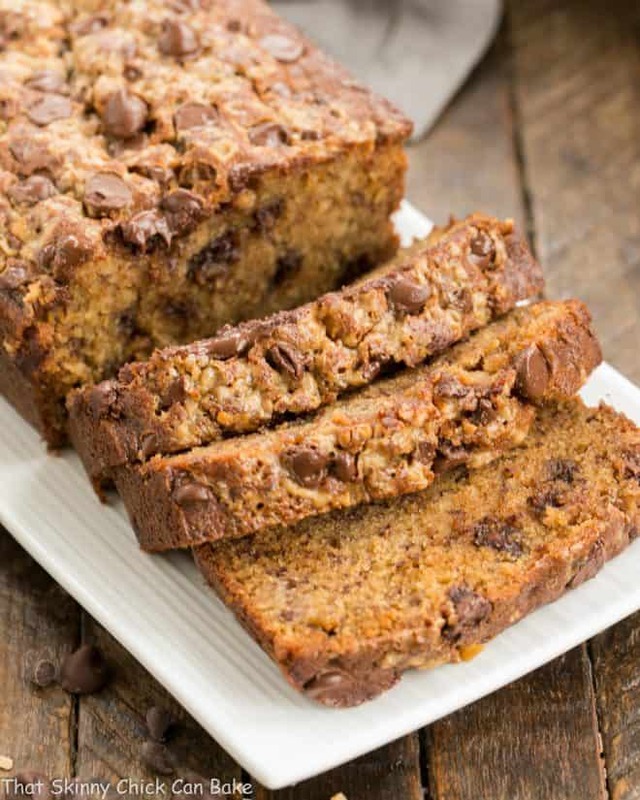 Chocolate Chip Toffee Banana Bread kicks up a traditional banana loaf recipe by adding loads of chocolate and toffee chips. Perfect made into muffins, too, for a grab and go breakfast or snack. You may never go back to plain ol’ banana bread again! 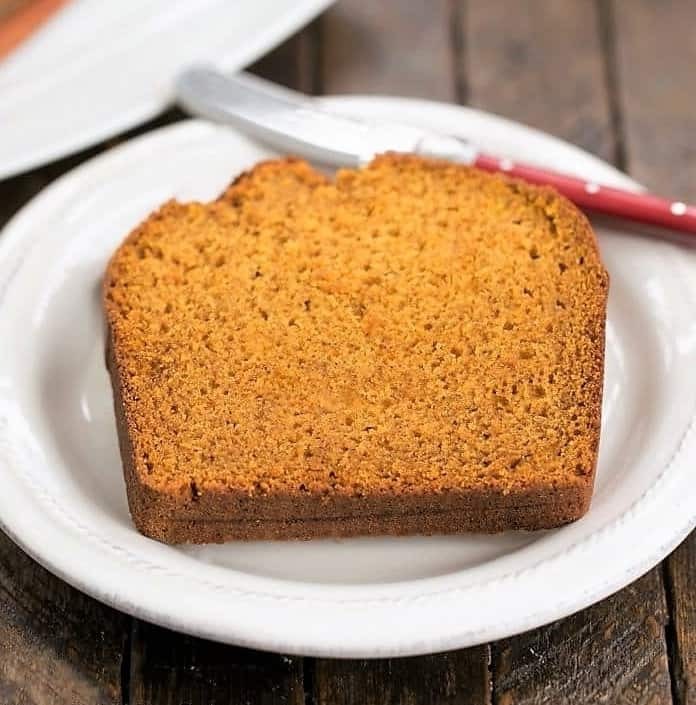 This recipe is from the newly released cookbook, The Weekday Lunches & Breakfasts Cookbook: Easy & Delicious Home-Cooked Meals for Busy Families, by my friend, Mary Younkin. 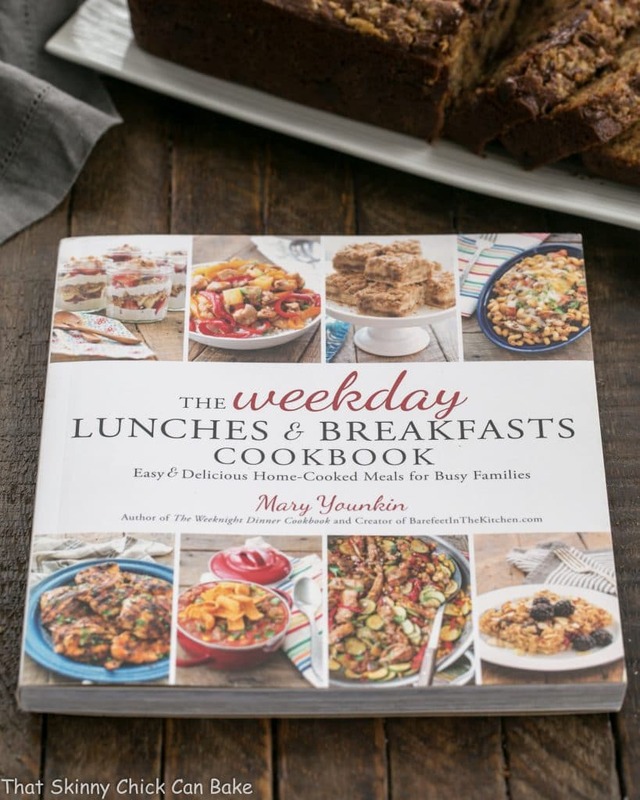 My lovely, kind-hearted blogger friend, Mary Younkin, creator of the blog, Barefeet in the Kitchen, just published her second terrific, family friendly cookbook, The Weekday Lunches & Breakfasts Cookbook. It’s a follow up to Mary’s popular The Weeknight Dinner CookbookThe Weeknight Dinner Cookbook: Simple Family-Friendly Recipes for Everyday Home Cooking. Check out the Lemon Curd Mini Cheesecakes I made from that wonderful cookbook in 2016. I have a slight addiction to anything “toffee,” so when I spotted her chocolate chip toffee banana bread, I knew I’d have to bake up a couple loaves. The picky daughter saw the bananas come out of the freezer and could hardly wait to have a slice! Full of melty chocolate chips and toffee bits, it was banana bread on steroids. One glorious banana bread! I used to toss ripe bananas, peels and all, into a gallon ziploc bag to freeze. It might be months later that a craving for banana bread or hummingbird cake arises. I had heard that peeling them first was the most efficient way to freeze bananas, but my technique always worked, so why change it? Well freezing in the peels always worked for me, until this time. When peeling those frozen numbers, the outer peel split from an inner layer. I had to resort to scraping that residual peel off the ice cold, soft and oozy bananas. Ugh. So, after today, I will be peeling my ripe bananas before freezing them. 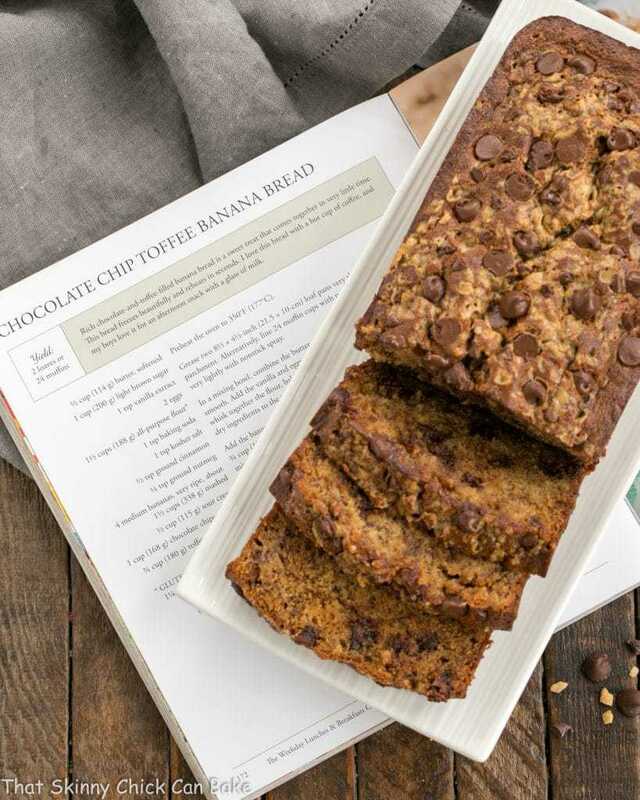 It’s the perfect way to be ready for those banana bread cravings. I’m truly stuck in a rut when it comes to breakfast and lunches. So this cookbook arrived at my doorstep just in the nick of time. I definitely have a few favorites, but when I am busy testing out new dinner and dessert recipes, the the other meals get ignored. Thank goodness for this terrific cookbook! 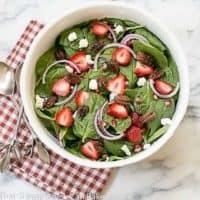 Mary’s tempting Spinach Couscous Salad with Chicken and Cranberries is up next for my post Easter weekday lunches. To shake up my breakfast routine, her Savory French Toast Bake with ham, Swiss cheese and asparagus will make for a happy hubby and equally happy and satisfied cook. I cannot ignore desserts so, the Perfect-Every-Time-Brownies will be on our dessert menu soon—rich and fudgy, I know the family will approve. Don’t forget to check out The Weeknight Dinner Cookbook: Simple Family-Friendly Recipes for Everyday Home Cooking (amazon link at the top of the page), another winner! 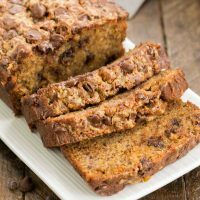 This rich chocolate and toffee filled banana bread is a sweet treat that comes together in no time! Grease two 8 1/2 x 4 1/2-inch loaf pans thoroughly or line with parchment. Alternatively, line 24 muffin cups with paper liners and spray the liners very lightly with nonstick spray. In a mixing bowl, combine the butter and sugar, and beat with a mixer until smooth. Add the vanilla and eggs, and beat until smooth. In a separate bowl, whisk together the flour, baking soda , salt, cinnamon, and nutmeg. Slowly add the dry ingredients to the wet ingredients, beating just until they’re combined. Add the bananas and sour cream, and stir just until they’re combined Stir in 3/4 cup of chocolate chips and 1/2 cup of toffee chips. Pour the mixture into the prepared pans or muffin tins. Sprinkle with the reserved chocolate chips and toffee chips. Bake the full-sized loaf pans for 55-60 minutes and the muffins for 20-22 minutes, until a inserted toothpick comes out with moist crumbs. Let the loaves cool completely before sliding a knife around the edge of the pan to loosen and then remove to a plate or wire rack. Add the bananas and sour creams, and stir until they’re combined. Stir in 3/4 cup of chocolate chips and 1/2 cup of toffee chips. Pour the mixture into the prepared pans or muffin tins. Sprinkle with the reserved chocolate chips and toffee chips. Bake the full-sized loaf pans for 55-60 minutes. May freeze for 2-3 months. To freeze muffins, simply cool and store in a zip-topped bag. To freeze a loaf, cool completely then wrap, unsliced, in foil before placing in a large zip-topped bag. Banana and chocolate both are my favorite and this recipe is going to be on the top of my cookbook list. The elegant look is heart melting. I would love to have this . 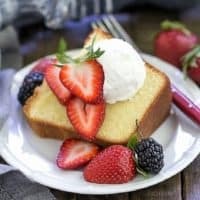 Amazing recipe dear Liz! We can’t wait for the Lent to be over (Orthodox Easter is on this Sunday) to try it out! We don’t know if we can find toffee chips, but maybe butterscotch would also work? KUDOS, for another awesome post! 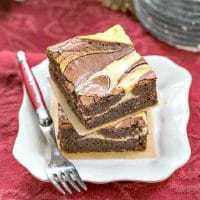 This looks rich and amazingly delicious with chocolate and toffee! Gosh! 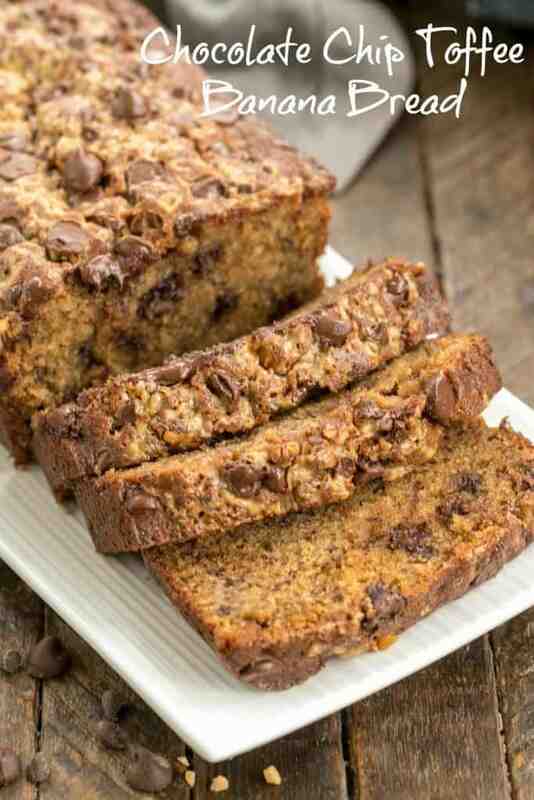 This is a to die for banana bread! Freezing bananas is a new concept for me and I tried it recently. It’s kinda awful once defrosted, all gooey and watery. But surprisingly it still tastes good in bakes. Never heard of banana bread. Thank you for such a wonderful idea. Will try this very soon! What a delicious combination and a gorgeous loaf of bread! I love the tip about peeling the bananas too! I’m so happy that you’re enjoying the cookbook! This is our favorite banana bread now. (Who can resist all that toffee??) Your photos are making me crave it all over again too. I love banana bread. The chocolate chips and the toffee chips make it extra special. I have never thought about this combination – banana and choco chips in my entire life. But you know the pictures are looking great and the recipe is not hard either. So I am gonna make it this weekend itself! Chocolate chips? Toffee chips? Bananas? What a trio of terrific flavors! This looks excellent — such a great bread. Thanks! 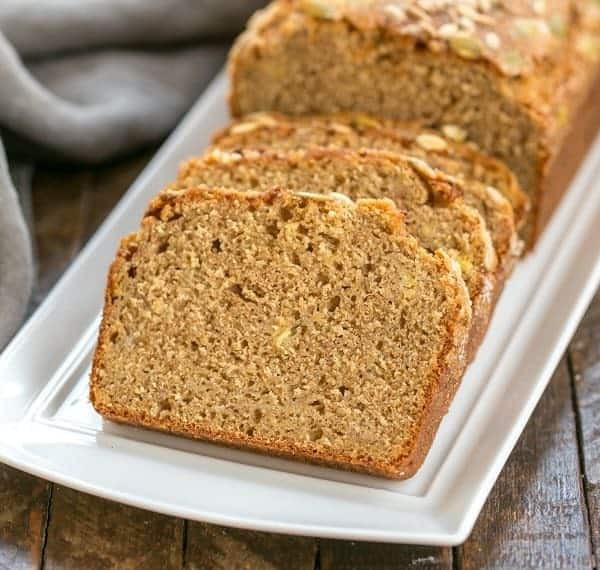 A great twist on banana bread, sounds good! Thanks for the recipe! I have the same addiction to toffee – and it would definitely take banana bread to a whole other level!! Yum! 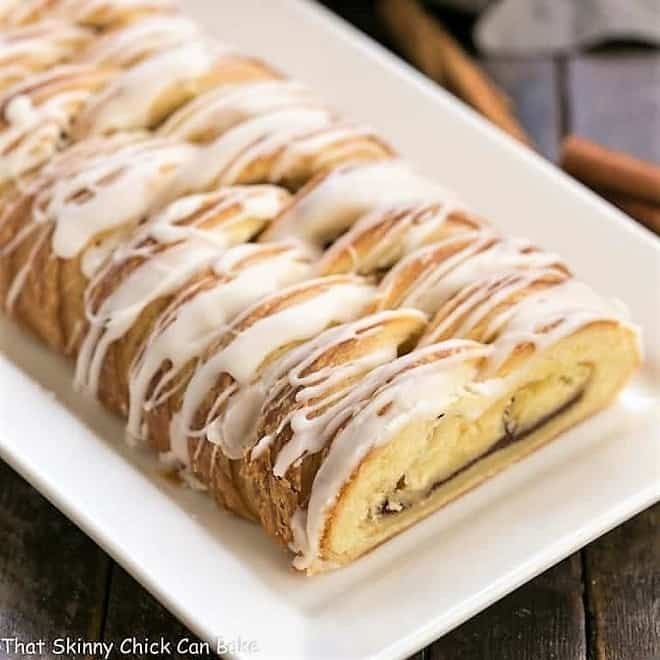 This is definetly going on my to bake list. I love all banana breads and all that chocolate and toffee in this loaf must send this one over the edge. This does sound fabulous! Brown sugar and toffee…I’ll be trying this as soon as my bananas are brown! I saw this recipe come through with my e-mails last week and was anxious to read your post. First, congratulations to your friend for her cookbook and congratulations to you for taking it up a notch. I always peel my bananas and throw them in a bag for the freezer in anticipation for a future smoothie. After reading your post, I won’t change my method. Now I’m sorry I threw out my bananas. I love the addition of toffee and will stock up on bananas. I see the word “toffee” and I’ve just got to go there. 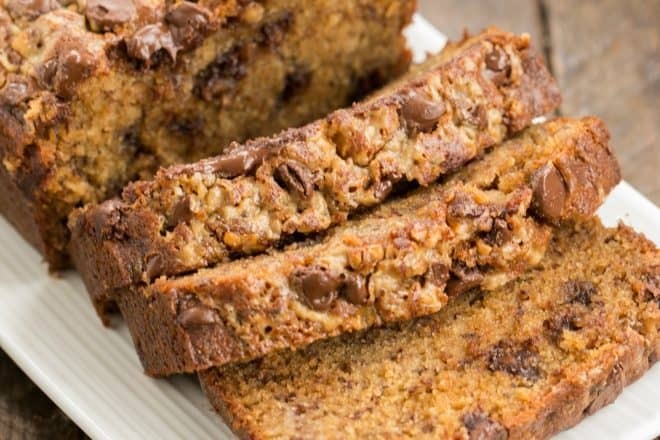 You really took banana bread to a new level with this recipe. Crazy awesome!